"Virtualization is a technology that combines or divides computing resources to present one or many operating environments using methodologies like hardware and software partitioning or aggregation, partial or complete machine simulation, emulation, time-sharing, and many others." This means, that virtualization uses technology to abstract from the real hardware and provides isolated environments, so called Virtual Machines. They are capable to run various applications or even a whole operating system. A goal not mentioned in the definition is to have nearly to native performance for running VMS. This is a very important point, because the users always want to get the most out of their hardware. Most of them are not willing to introduce virtualiztion technology, if a huge amount of CPU power is wasted by managing VMs. 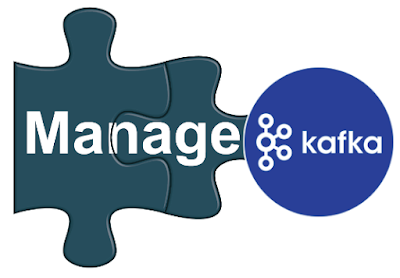 KVM is the first virtualization solution that has been integration into the vanilla Linux kernel. KVM has been initially developed by Qumranet, a small company located in Isreal. Redhat acquired Qumranet in September 2008, when KVM become more production ready. They see KVM as next generation of virtualiztion technology. Linux has all the mechanism a VMM needs to operate several VMs. 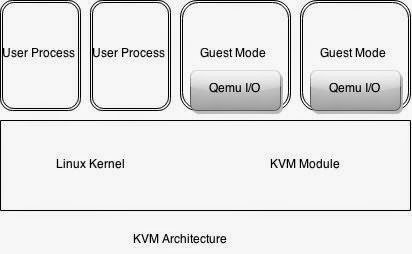 KVM is implemented as a kernel module that can be loaded to extend Linux by these capabilities. 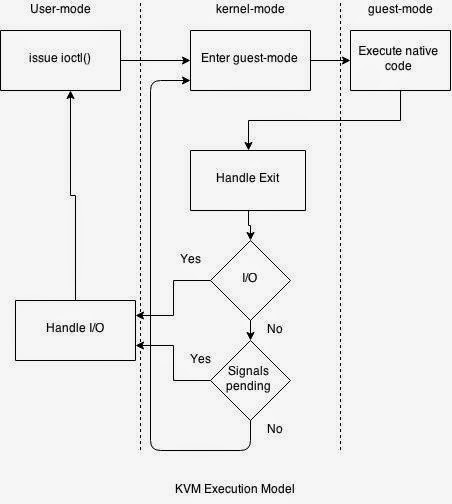 user-mode: I/O when guest needs to access devices. To increase the reuse code as mush as possible they mainly modified the Linux memory management, to allow mapping physical memory into the VMs address space. Therefore they added shadow page tables, that were needed in the early days of x8 virtualization. The scheduler of an operating system computers an order in that each process is assigned to one of the variable CPUs. In this way, all running process is assigned to one of the available CPUs. In this way, all running processes are share the computing time. Since the KVM developers wanted to reuse most of the mechanisms of Linux. They simply implemented each VM as a process, relying on its scheduler to assign computing power to the VMs. Once the KVM kernel module has been loaded, the /dev/kvm device node appears in the file-system that represents the interface of KVM. It allows to control the hypervisor through a set of ioctls, commonly used in certain operating systems as an interface for processes running in user-mode to communicate with a driver. The ioctl() system call allows to execute several operations to create new virtual machines, assign memory to a virtual machine, assign and start virtual CPUs. To provide hardware like hard disks, cd drivers or networks cards to the VMs, KVM uses a highly modified QEMU, This is a so called platform virtulization tool, which allows to emulate an entire PC platform including graphics, net working, disk drives and many more. Figure describe the execution model of KVM. This is the loop of the actions used to operate the VMs. These actions are separated by the three modes. user-mode: The KVM module is called using ioctl() to execute guest code until I/O operations initiated by the guest or an external event occurs. Such an event may be the arrival of a network package, which could be the reply of a network package sent by the host earlier. Such events are expressed as signals that leads to an interruption of guest code execution. Kernel-mode: The kernel causes the hardware to execute guest code natively. IF the processor exits the guest due to pending memory or I/O operations, the kernel performs the necessary tasks and resumes the flow of execution. If external events such as signals or I/O operations initiated by the guest exists, it exits to the user-mode. guest-mode: This is on the hardware level, where the extended instruction set of virtualization capable CPU is used to execute the native code, until an instruction called that needs assistance by KVM, a fault or an external interrupt. While a VM runs, There are plenty of switches between these modes.